Finding healthy food that is also portable and durable for traveling can present quite the challenge. Whether you are in a vehicle, boarding a flight or you are just in an environment when you cannot purchase or store food. I like to take healthy snack food along with me when I will be away from home for several hours, including when I go to work. Most of us have access to a fridge at our workplaces. What happens when you are on the road or some similar situation? Below are my top six foods for eating on the go. The factors I considered were: overall nutrition content, minimal processing, portability and durability and of course the taste. Raw homemade trail mix tops my list. My favorite combination is raw pumpkin seeds and raisins or dried cranberries. Raw nuts, sunflower seeds and other types of dried fruits can also be used. Raw seeds, nuts and fruits contain, fiber, protein, zinc (pumpkin seeds) and a variety of vitamins and minerals. Some dried fruits, such as cranberries do have added sugar, but if you stick with raisins and other naturally sweet dried fruits, you can eliminate that issue. You can carry your trail mix in a small tuper-ware container or a ziplock bag. It will survive hot and cold environments and being in a handbag or other carrying vessel. No need to worry about it getting squashed or disfigured. If you want to get fancy, you can make more or a granola with dried unsweetened coconut shreds or flakes and uncooked rolled oats (not raw anymore). Kale Chips are number two because they are not as durable. You do have to be careful to avoid crushing them so that you don’t end up with kale crumbs. Apart from that they have protein, iron, fiber, calcium, vitamins and other nutrients. My brand of choice is Trader Joes’s because they contain simple ingredients, they are delicious and they are cheaper than just about every other brand I’ve seen so far at $3.99 for a 2-serving bag. Fresh fruit (of course). Some fruits are more durable and portable than others. For example, apples, bananas and pears can be carried as whole fruits. Beware bananas do not do well in dark places unless they were only semi-ripe to begin with. For fruits like manages and pineapple, they would have to be cut into smaller pieces a head of time and carried in a container. They are also get messy because they are so juicy. Once a fruit if cut, it does not last as long or taste as good if not eating quickly. Berries are pretty portable too but can easily be squashed in transit. Now I’ll move onto a few packaged snacks that I will eat if the top three are unavailable. Larabars are an easy-to-transport snack that is not overly processed. Go with a flavor that preferably does not have dairy. Their base is nuts and dates and then whatever else they add depending on the flavor. Dome examples are chocolate chips, coconut and dried fruits. Pop Corners (sea salt flavor only) are a popped corn chip. So they are low fat. The Sea Salt flavor has three ingredients: corn, sunflower oil and sea salt!! They do not offer much nutritional value apart from carbohydrates. If you just need a light snack, they are way better than their alternatives of fried or baked chips laden with oil, artificial flavors and preservatives. I avoid the flavored pop chips such as sour cream and cheese. The ingredient list on these is 10 times longer and it’s all bad! Tons of artificial flavors and all a sundry. 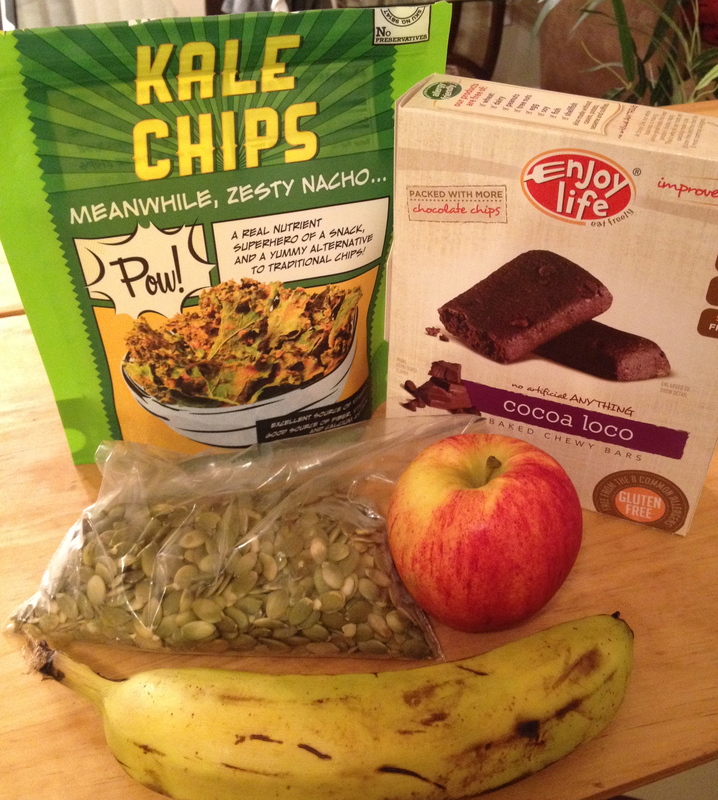 Enjoy Life brand snacks are vegan, gluten free and soy free so that gets them some points. They are however, processed. If I need something sweet, their Cocoa Loco bars hit the spot. They get an A+ for portability and not being totally junky food but would not be my first choice.